Now artists use it as a place to set up each month before LoDa ArtWalk, but an owner and developer were hopeful the 9,000-square-foot building at 401 Dauphin St. could be transformed into the city’s newest music venue. Those hopes took a hit Tuesday after owner Buzz Jordan and developer Tom Townsend withdrew their appeal of previous Planning Commission decisions to not allow an increase in occupancy. Jordan and Townsend had initially asked for 1,000 before scaling it back to 850 persons. During a pre-conference meeting, the City Council discussed the possibility of allowing an occupancy of more than 100 but “much less” than 1,000, with Councilman Fred Richardson asking Jordan if that was possible. Jordan said he’d discussed it with Huka Entertainment, who would manage the facility and said they’d be willing to do it, a sticking point being a proposed occupancy number. Going by the occupancy number listed in the application, Councilman Levon Manzie said he wouldn’t be able to support the appeal. Jordan said the plan could still come together with an occupancy of 600, but according to council attorney Jim Rossler’s interpretation of the law, the Council should defer to the Planning Commission regarding conditions on the property. Citing the form-based code passed May 2014, Councilwoman Bess Rich said it’s too soon to drastically change a recent ordinance. After withdrawing the appeal, Jordan told reporters his team would regroup and try to find a number all parties could agree on. Jordan and Townsend will have to wait six months before they can file another application with the Planning Commission. In order to make the proposed venue profitable sooner, Jordan wants to expand the building’s occupancy beyond the 100 currently allowed. The Planning Commission has twice denied his request after hearing boisterous opposition based on concerns about noise, traffic and aesthetics. Some of those in opposition live in the nearby Mattress Factory building and fear the proposal will turn into a situation similar to the Alabama Music Box. Jordan and Townsend said they’ve heard the complaints before and have tried to assure those opposed that they will follow the rules. Those in opposition, Townsend suggested, are using an example of a “worst-case scenario” and have no facts to back them up. As for the harmony of the neighborhood, Jordan pointed down the block to Buck’s Pizza and across the street to a parking lot. As artists were setting up for ArtWalk across the street on the Friday before the meeting, he turned around to show Hoffman Furniture, which closes at 5 p.m. and the residential building catty-corner to his space. He also pointed to several vacant buildings. “I guess a dilapidated building fits with the harmony of the neighborhood,” Jordan said. Per the city’s noise ordinance, Townsend said, the venue can only reach 50 decibels from the sidewalk after 10 p.m., similar to the volume inside an office or classroom. “We are legally required to do that,” he said. Before 10 p.m. the decibel level can be as high as 80. A jet engine, for instance, is 120 decibels, Townsend said. To control the noise, Townsend said, the building will be mostly 16 to 18 inches of brick with a glass facade. The glass will be double-paned and each panel will be reinforced with rubber seals to reduce vibration. This, he said, would cut down on the noise. The building, which has been vacant for years, would undergo $750,000 to $1 million in renovations to bring it back to its 1940s-era luster, using federal historic tax credits, developer Townsend said.The building’s two floors would be opened up for a balcony and atrium and there would even be a roof-top patio in later phases. The venue would benefit the city, Jordan said, bringing in about $100,000 in tax revenue, for example. With Huka Entertainment managing it and with an occupancy of 850, Jordan said, the venue would be able to attract music fans from across the region. By comparison, Vinyl Music Hall in Pensacola seats 300, Jordan said. “They won’t be able to get the same quality acts,” he said. Townsend, who owns a downtown apartment complex, said data nationwide shows a venue like the one proposed will actually increase nearby property value, not decrease it. For example, he said the 9:30 Club in Washington, D.C., increased property value in a 300-foot radius to $500 per square foot. Property around the Whiskey-A-Go-Go in Chicago is $500 per square foot, he said. Jordan said he could turn the building into a pawn shop now without any approval from the Planning Commission. But “it wouldn’t add to the ambiance of downtown,” he said. The building at 401 Dauphin Street dates back to the 1850s and was initially three separate spaces, Townsend said. In 1938, the building was converted into one space. The council voted 6-1 to amend an ordinance to make all city-owned buildings, facilities and parks free from all forms of tobacco. This includes the buildings themselves as well as their campuses and public lands where the public congregates, according to the amendment. 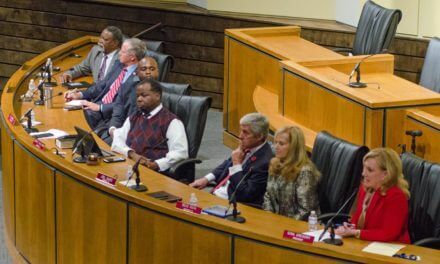 The lone dissenting vote belonged to Councilman John Williams, who said he believes smoking should be banned, but balked at including smokeless tobacco products because they don’t harm the health of anyone but the user. The council also passed a resolution asking the Mobile County Commission to make Government Plaza a smoke-free campus.